Barnacle cover at Treasure Island was variable but exhibited a general decline over the course of the monitoring period, particularly between 1999 and 2003. Following low cover values of ~40% in 2003, there was a recovery period in which barnacles increased to ~80% cover on average, but subsequently abundance dropped below an average of 30% cover by Fall 2013. During periods of low barnacle cover, there were concurrent increases in the cover of bare rock. From 2009-2012, cover consisted of approximately half bare rock and half barnacles. Cover of the ephemeral alga Ulva was very low in all samples from 1996-2005. However, in two plots, there were large inundations of Ulva in fall 2005, spring 2006, and spring 2007 with additional increases in Ulva in one plot in spring 2008 and spring 2010. Non-coralline crusts exhibited two peaks in cover in spring 2003 (17%) and spring 2008 (9%), reducing bare rock cover during those periods. Littorina spp. counts in barnacle plots are extremely high with only occasional limpets found during certain sampling seasons. Mussel cover at this site was relatively low at initiation of the monitoring in 1996 and decreased during subsequent sampling into the 1997-1998 El Niño. Cover remained low through 2002 but recovered to moderate levels in 2003 – 2004 with an increase of 40% during that year. Unlike the other sites in the region, the severe 2007 storm only resulted in a 10% loss of mussel cover in monitored plots, although mussel loss did occur at this site in the lower intertidal zone (below the area of the fixed photoplots). Mussel cover increased again in 2011 (exceeding 75% of plots on average) but since 2012, cover has declined to levels similar to the lowest levels observed since 1998. Bare rock cover was often high during periods of low mussel cover, with exception of seasons when barnacle cover increased, such as in fall 1999 and spring 2002. Other taxa found in the mussel plots included crustose corallines, Tetraclita, and non-coralline crusts but cover of these groups was highly temporally variable. Limpet counts in mussel plots varied greatly over time with peaks in 2004 and 2009, while other motile invertebrates were relatively low in numbers. Rockweed cover showed seasonal fluctuations typical of this region with higher cover in the fall than in spring sampling periods. Rockweeds exhibited highly variable cover over time with a general pattern of low cover from 2005 - 2010. The lowest cover (~38%) occurred in spring 2006. 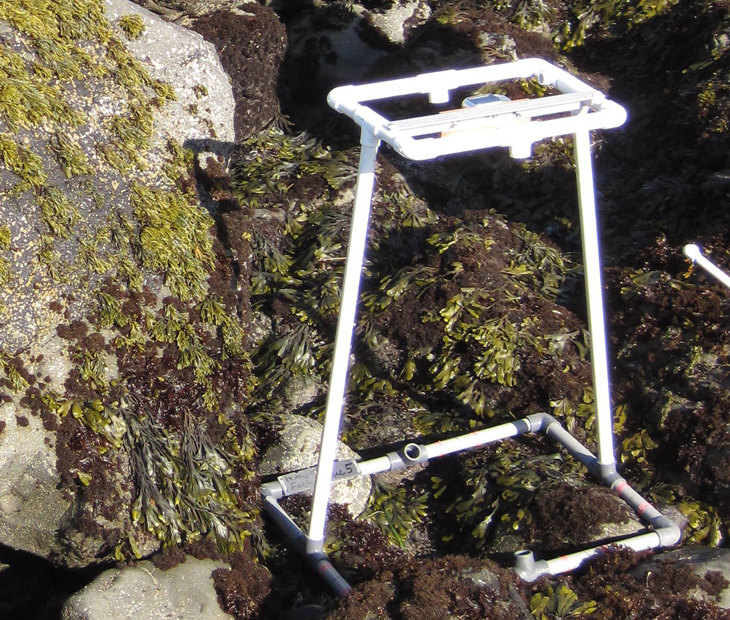 At this time, barnacle cover reached its peak (~40%); aside from this high value, barnacles generally covered 5-10% of the surface in rockweed plots (on average). Cover of bare rock was highly variable, reaching peaks (20-25%) in 1999 and between 2007 and 2010. Mussel cover was very low in rockweed plots from 1996 to 2003 but increased to 4-9% cover after 2004. Hesperophycus was absent from 1996 to 2002, but abundance increased for a short period in 2003 with a peak of 8% cover in spring; this increase was short-lived, as it was followed by a die off in fall, and Hesperphycus cover has since remained low through 2014. Articulated corallines, crustose corallines, non-coralline crusts, other red algae, and Ulva were also common in Silvetia plots but highly variable in cover over time. Motile invertebrate counts were dominated by Littorina spp. and limpets that exhibited high variability over the years. Littorina abundances were low in 2012 and 2013. Chitons, the predatory snail Nucella, and hermit crabs have been consistently found in low numbers. Rock plots were established at this site in Spring 2011 in areas above the barnacle zone. These plots are predominantly bare rock, and average cover of rock has remained high (above 80%) since their establishment. A heavy influx of sand covered one plot (100% cover of sand) on two occasions (Fall 2011 and Fall 2012), resulting in an overall lower average cover of rock in the sampling plots on these two sampling dates. Motile invertebrate counts within rock plots consisted primary of moderately high numbers of Littorina snails. Site-wide sea star (Pisaster) counts, which were low from 1996 to 2004, increased dramatically in 2006 when over 150 individuals were observed at the site. After this 2006 peak, sea star abundance varied among sampling periods but did not exceed 100 individuals per survey again until Fall 2013. As with other Orange County sites, a large increase in sea star abundance was observed in Fall 2013. Signs of sea star wasting syndrome were noted in a few individuals at this site during the Fall 2013 Pisaster survey. 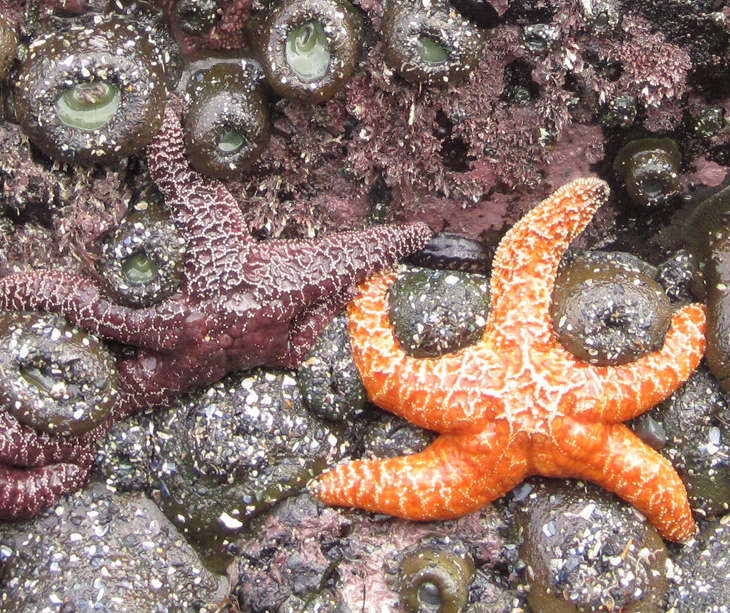 In Spring 2014, no Pisaster were found at this location; Sea Star Wasting Syndrome is a likely factor in this decline. Sea star sizes were consistently measured starting in Spring 2012. 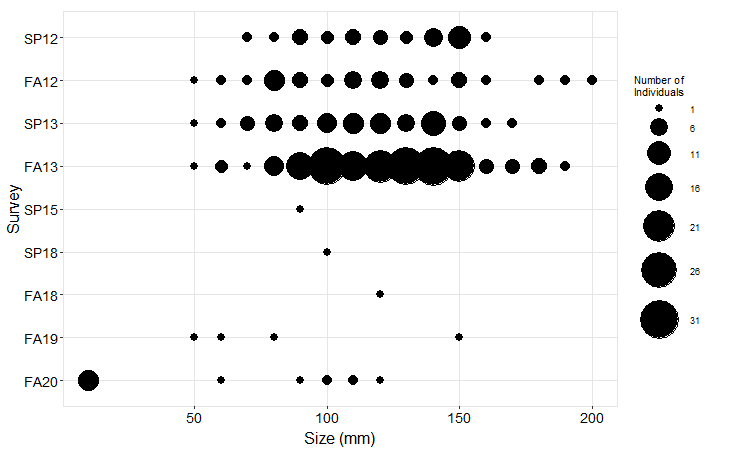 Most individuals fell in the 100-150 mm size class.